Image Credits: Republic of Korea / Flickr. Interesting stuff today. A major Russian TV channel just aired a report about Putin meeting with his top military commanders. 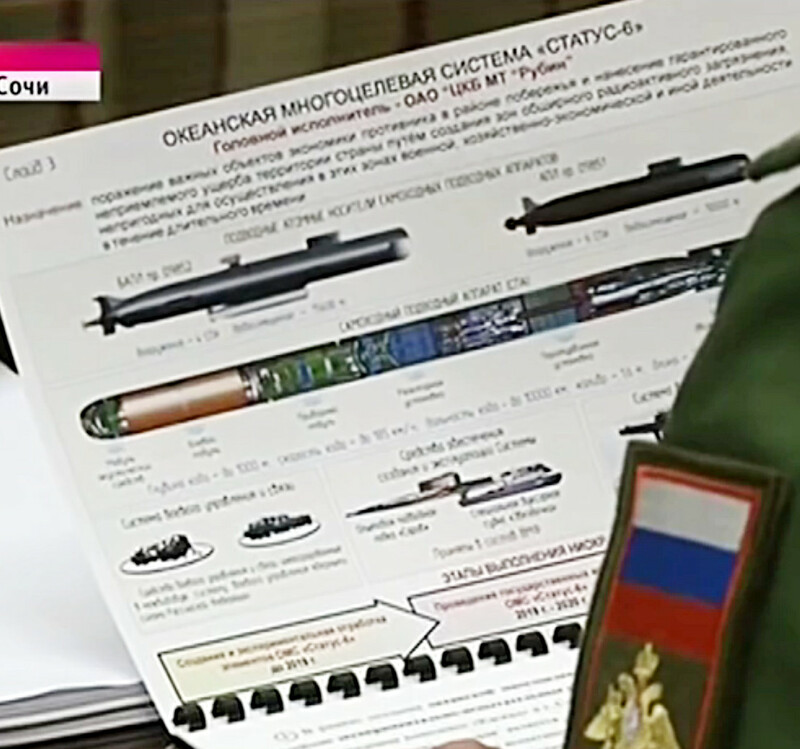 The presentation slide titled “Ocean Multipurpose System: Status-6” showed some drawings of a new nuclear submarine weapons system. It is apparently designed to bypass NATO radars and any existing missile defense systems, while also causing heavy damage to“important economic facilities” along the enemy’s coastal regions. The footnote to the slide stated that Status-6 is intended to cause“assured unacceptable damage” to an adversary force. Its detonation “in the area of the enemy coast” would result in “extensive zones of radioactive contamination” that would ensure that the region would not be used for “military, economic, business or other activity” for a“long time.” According to the blurred information provided in the slide, the system represents a massive torpedo, designated as“self-propelled underwater vehicle,” with a range of up to 10 thousand kilometers and capable of operating at a depth of up to 1,000 meters. Actually, such ideas are nothing new. The late Andrei Sakharov had already proposed a similar idea to basically wipe out the entire US East Coast. The Russians have also look into the possibility to detonate a nuclear device to set off the “Yellowstone Caldera” and basically destroy most of the USA in one shot. While in the early years following WWII the Soviets did look into all sort of schemes to threaten the USA with destruction, the subsequent development of Soviet nuclear capabilities made the development of this type of “doomsday weapons” useless. Personally, I don’t believe for one second that the Russians are now serious about developing such system as it would be literally a waste of resources. So what is going on here?